Today, I went to the dentist, ICK! Fortunately I have no cavities, but it turns out that my right sinus is sitting right on the nerve of one of my upper molars, thus causing some funky pressure type sensation when my allergies act upt. It doesn’t hurt, but it feels like someone is pressing against the top of my jaw. Very strange. After the dentist, I sat for a while waiting for our new dishwasher delivered. Our old one “worked” but I had to run it through the rinse cycle twice to get the soap off top rack items. It sucked. Now we have a nice new functioning dishwasher and no spots on our dishes:) After that I sat around and watched King Arthur. It was okay, but I was interested that the writer and director chose to do a version that explored more of the “historical” theories of Arthur rather than the mythical and literary versions of the story. I also went to target and spent some birthday gift cards. I got a chair for my craft room, a pair of shoes and a new work bag. I still have a little left over too! On the stitching front, I sent out both my House Exchange and Mylene’s Round Robin yesterday. I will post a pic of my exchange as soon as my partner gets it. Here is a pic of Mylene’s RR. She chose a seasonal theme river/tree theme. It was very pretty. I picked summer as my favorite season. I may have thought twice if I had really looked at the pattern. It had some fractional stitches for the apples, which I do not like to do on aida. It turned out really pretty though and I got a lot of compliments from family and coworkers. Here it is so far. Mylene stitched the spring section on the right. 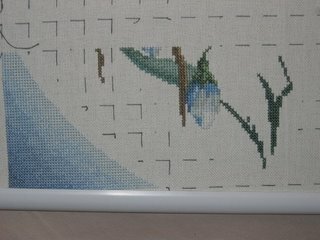 While I watched King Arthur this afternoon, I stitched a bit on Butterfly Rest. I finished the first flower bud and did some more on the flower stem. It is actually stitching up pretty fast. I should be done with this first page pretty quickly. Unfortunatly it is smaller than the other pages. Your RR Summer piece is very pretty. I hope your friend will like it. You did a great job on Mylene’s RR. What a lovely piece! Both pieces look great. I am still not sure if I liked King Arthur or not. It was very…different, which is fine but still…. not sure. 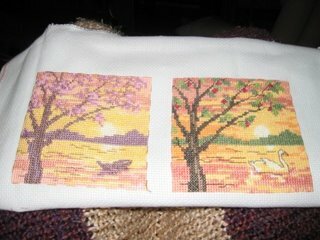 I love to watch movies while stitching. I recently bought Prison Break season 1 on DVD and am going to marathon watch it this weekend b/c it starts up again Monday night. Ann. Hi leslie, thanks so much for stitching on my rr. I love it!!!!!!!! The RR is really pretty. You did a lovely job! Discovered you via Mylene’s blog & just read that today is your birthday. HAPPY BIRTHDAY!!!! Your RR summer is lovely as is the new piece you’re working on. Butterfly rest is sure looking good! Good work! The RR you did looks lovely.